There is an Anglican tradition of contemplative prayer (patrimony) which consists in kneeling, sitting, lying, in silence. It is an aphophatic way,it uses no images or narratives, it has no theme or passage, it does not seek pathways or destination; it is silence before the reality of God. It is a way taught within Anglicanism for most of the last century; Fr Gilbert Shaw was the great apostle of the methodology, in recent years Fr. Bill Scott has guided people in this way. It is a methodology without methodology, it consists in the silence, not in listening for a voice in the silence, not in listening to the silence as a voice, it is the silence. This way is not to be found in intrusion into the silence, it is not a journey to God found beyond the silence by becoming one with the silence in which God may be found. It is the silence. The prayer is not in embracing, moulding or entering into the silence, it is not in letting the silence be moulded around the soul at prayer, or the woman in the application of the silence. It is the loss of everything that is not the silence, it is not the loss of self, it is the silence. It is not discerning the ‘heart-beat’ of God, but it may be hearing therumours of the wordless love of the Sacred Heart, which can be heard only in the silence. Reposted from Fr Jones, of St Peter’s, London Docks HERE on 25 January. Last Tuesday my local clergy book club met. We discussed Sara Maitland’s new(ish) book: ‘A Book of Silence’. We were not overly impressed. We though she was approaching the subject of silence in a far too academic a way – and was sometimes confusing it with ‘solitude’. For example, she writes that she had spent some time alone in the Sinai desert reading the Sayings of the Desert Fathers – we all felt she should have left the book behind and tried to read the silence itself! However. Three of us (out of six) had attended a meeting last September addressed by Fr Laurence Freeman, a Benedictine monk who now heads up the late John Maine’s ‘World Community for Christian Meditation’ http://www.wccm.org/, and he had much more powerful stuff to say about silence. A meditation mat and cushion, a Buddhist ‘singing’ bowl (chime) and striker, a watch, and, by coincidence, a copy of my latest discovery: ‘Benedictine Daily Prayer – A Short Breviary’ produced by St John’s Abbey, Collegeville, Minnesota (ISBN 1-85607-495-1 The Columba Press, Dublin). As someone who has struggled for the last thirty years or more to find the ‘right’ form of daily office (- I know, a desperate situation to be in!-) this comes very close to fitting the bill. For the last few years I have been juggling with two forms: ‘The Divine Office’ (the official UK RC version) and ‘Daily Prayer’ (the Church of England’s Common Worship version). Both have much to offer. ‘Benedictine Daily Prayer’ is one book, Grail Psalms, two scriptural readings in the night office (all NRSV), only occasional patristic readings, traditional office hymns (albeit in a modern translation), re-written antiphons and responses, and even the occasional Anglican feast day to supplement the Benedictine Calendar. It is a joy to use. I recommend it. There I was, a new curate, new to Manchester, new to the North, wondering what this ministry thing entailed. GFD, as Gordon was know to his curates, had the answer! “Spend the morning with your books,” he said, “the afternoon visiting parishioners, and the evening for anything else!”. GFD spent his mornings principally with St Paul, making neat notes in a series of small, pre-Filofax multi-ring binders. “Focus on one small area of study”, he would say, “stick with it, and you’ll find that will lead you into all sorts of other areas.” Only lately have I learned of the depth of GFD’s study of St Paul. As a training incumbent GFD was ordered, rather than strict. We, two curates and GFD, would meet three times each weekday: mattins [when he could monitor our previous day’s visiting via our intercessions!] , a midday mass followed by lunch [accompanied by Radio 4 – Round Britain Quiz being his favourite], and evensong – with a staff meeting every Sunday evening. Visiting was at the heart of his pastoral ministry: organised visiting with the parish divided up into distinct areas [different areas, different days – so we didn’t clash! ], a simple but effective card index of every home in the parish, and different coloured inks for each of us to record our visits! Community was the thing, making connections. This pastoral heart extended beyond the parish to embrace the spiritual direction, counselling, and befriending of many in the diocese. A truly humble man – I remember when he was offered an honorary canonry; “I’m not sure,” he said, “that taking on a title without any accompanying work is what we’re all about.” And a poet! I remember taking a telephone call in the Rectory while GFD was out: a literary agent phoning to tell him that some of his poems had been accepted for publication – under a pseudonym, of course! 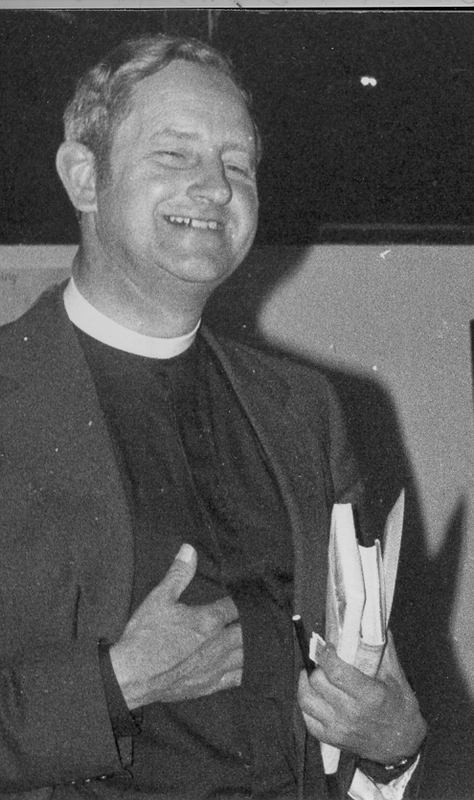 GFD was a solid, thoughtful, learned, caring, and deeply spiritual man – a loving heart beating within the concrete jungle of deck-access Hulme – making a great and lasting impression on a whole string of priests trained by him. Thirty years on, still remembered with affection and gratitude. Gordon Frederick Dowden: born 7 November 1925 – died 3 November 2008. Deaconed 1953, priested 1954. Curacies in Salisbury and Ely. Rector of St Philip’s, Hulme (1958-67); St Philip with St Michael, St Stephen and St Mark, Hulme (1967-70); St Philip with St Michael, St Stephen, St Mark, and St Gabriel Hulme (1968-70); the Ascension, Hulme (1970-78); Rural Dean of Hulme (1973-78); Priest-in-Charge of Holybourne with Neatham (1978-82); Rural Dean of Alton (1979-82); Assistant Curate of the Good Shep­herd, Manchester (1982-91); Area Dean of Ardwick (1982-90); Chap­lain of Ancoats Hospital, Manchester (1985-90). I sit at my desk, adding the final touches to the November edition of the parish magazine. I’ve had to add, this month, unusually, an extra sheet, an extra four pages. I’ve got stuff on ‘iris folding’, the Mothers’ Union, a Body Shop party, Webb Ivory, an interview with a parishioner by the youth club, fundraising news, stuff from the Cubs, Beavers and Brownies, pictures of the Duck Race, information on Parish Share, a report on a bell ringing competition, and another from the lunchtime fellowship. There’s the Parish Registers bit, the Calendar, and the Rota. Even with the extra pages, I’ve had to drop the readings for November, and no room to the Christian Aid figures for the local churches. All are packed in, some are crowded out! In some respects this is good—a reflection, perhaps, of an active, busy, wide-ranging parish. A draft of the magazine lies on the desk before me: 19 crowded pages, and a single blank one. My temptation is to leave it blank! We so often fill our lives with all sorts of stuff; our heads and our hearts, too. Filled with this and that, packed in, each competing with others for time and attention. Space is crowded out, silence is chased away by clamour, being is ousted by doing. Meister Eckhart, a 13th/14th century German Dominican spiritual writer, wrote: “There is nothing so much like God than silence”. Life needs within it a measure of space, of silence, of ‘being’ (rather than ‘doing’). We all need it. Silence and space are the lungs of the Spirit; without it we suffocate, we drown. Advent begins at the end of November, one of the two ‘preparation’ seasons of the church. Within the hustle and bustle of the run-up to Christmas, we need to make some space for the Christ Child to come into our lives, some small crib-sized space, so that, when he knocks, we have more to say than: ‘Sorry, no room within’.